In Europe, Epson is mostly known for its printers, but in its domestic Japanese market, the company is also known for its TVs, projectors, robots and computers. Now, Epson has launched a competitor to the Mac Mini: the Endeavor ST100. The machine is larger and heavier than the Mac Mini but it is available with Core 2 Duo processors with either 2.0 or 2.33GHz. Apple's Mac Mini is currently only available with Core Duo processors of 1.66 and 1.83GHz. Other differences between Endeavor ST100 and the Mac Mini is that Epson's machine features a built-in modem, VGA connector and two USB 2 ports at the front (to add to the four at the back). Users also have the option of choosing the hard disk size, from 40GB to 160GB. 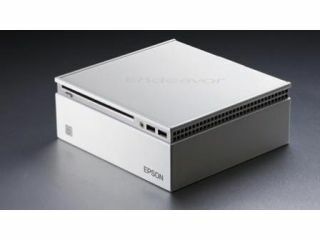 The Epson Endeavor ST100 is priced slightly lower than the Mac Mini. In Japan, the cheapest model is available from ¥60,000 (around £270 plus VAT) whilst a lower-end Mac Minis costs ¥75,000 (£335 plus VAT). The likelihood of the Endeavor ST100 finding its way to UK resellers is 'very small', an Epson representative admitted.